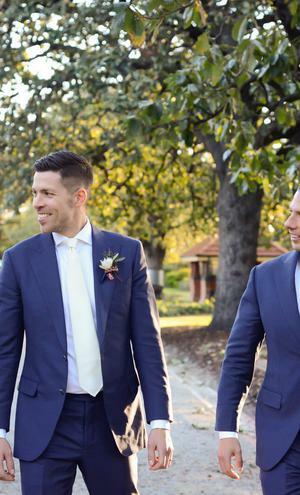 Emily and Pierre first met at a trendy beach bar in St Kilda, Melbourne, with Emily's friend and bridesmaid Anna knowing Pierre from way back. A year later Pierre popped the question on his birthday - a day that happened to coincide with another special day on the couple's calendar - Valentine's Day 2018. Emily had arranged to take her beau for dinner on his birthday, however before the pair headed inside they asked a passerby to take their photo - when Pierre turned to her and got down in one knee! Sadly, when it came to the wedding celebration, the day was bittersweet for the couple and their family, with Emily having lost her older brother just three weeks before. "It was incredibly difficult," says Emily, "when it first happened, I couldn't even comprehend the thought of a a wedding." She says that she likes to think of the beautiful weather on the day as Michael's doing, as it was the only day of that week the sun shone on the city. The wedding went ahead in August, with decor and suppliers decided on very quickly. "I did find all of the planning incredibly stressful at times," says Emily, "as I was doing everything by myself. 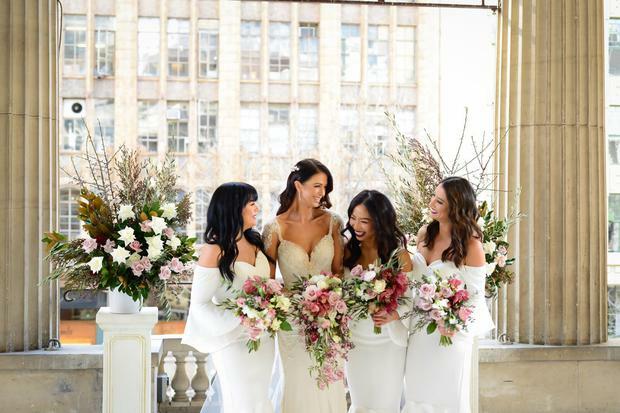 So much coordinating, and of course every bride wants it to all go perfectly, so the stress of that all adds up. It is like a full-time job!" 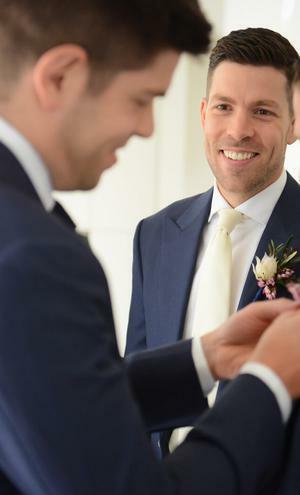 The couple had a budget of AUD$55,000 (€35,000) "and a number of collaborations" for their big day. Their photos are by Ateia Photography. 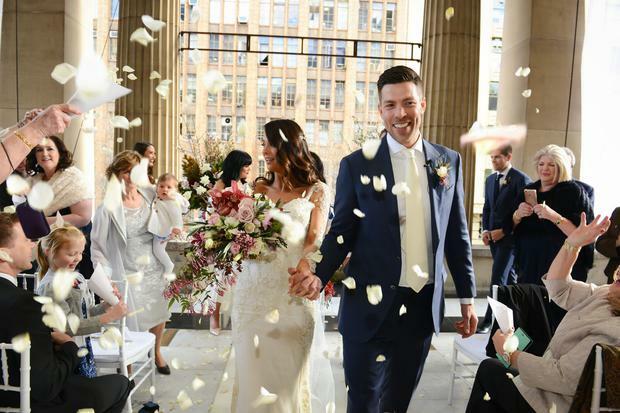 Emily's wedding dress was designed and made by Tanya Didenko Bridal Couture, whom the former Bachelor star has worn for several years. 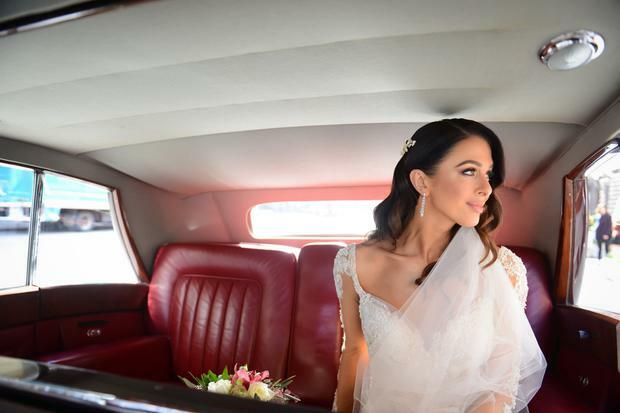 Unlike the majority of brides-to-be, Emily never actually tried on one wedding dress as she planned the big day, instead, she took several photos to Tanya and explained what elements of the dresses she would like for her own. 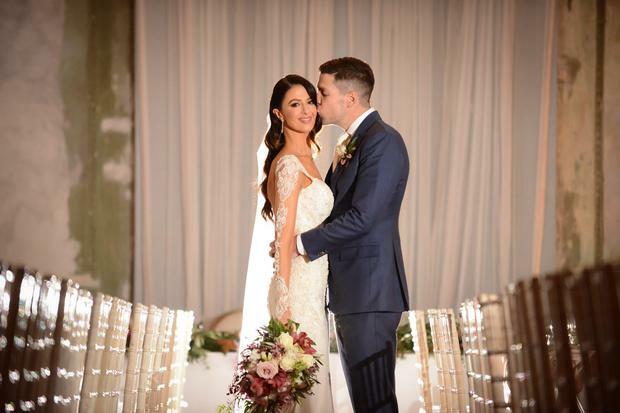 "She knows me quite well now, knows my body shape and knows my style, so it all worked really well," says the bride. As a make-up artist, the bride was well equipped to do her own make up on the day. 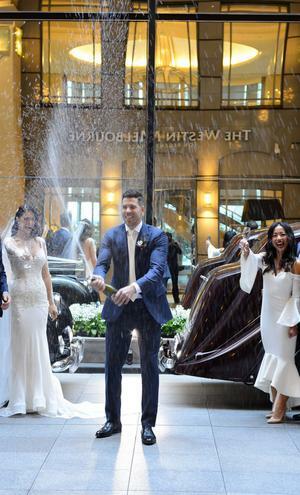 The groomsmen’s suits were made by groom Pierre’s youngest brother Remy, who owns a bespoke tailoring business in Sydney, while Emily's bridesmaids’ dresses were all designed by Love Honor. 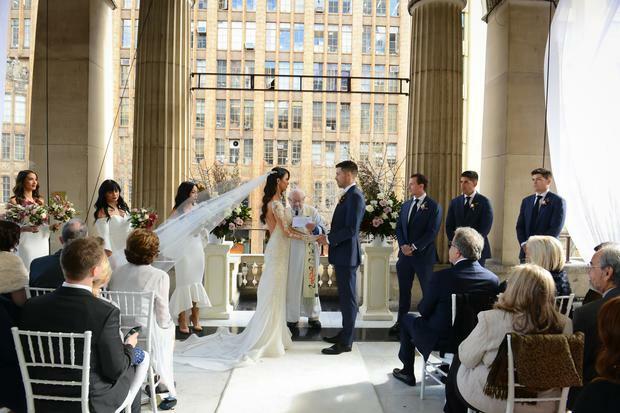 Pierre and Emily exchange vows on the balcony of the Melbourne Town Hall in front of 100 of their closest friends and family members. 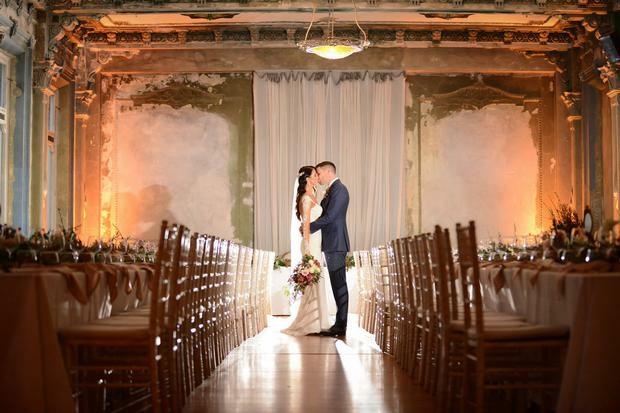 Emily was keen on the aesthetic of the day to flow nicely, and was particularly taken with the grand columns in the room that were in-keeping with the style of The George Ballroom, where their reception would take place later in the day. 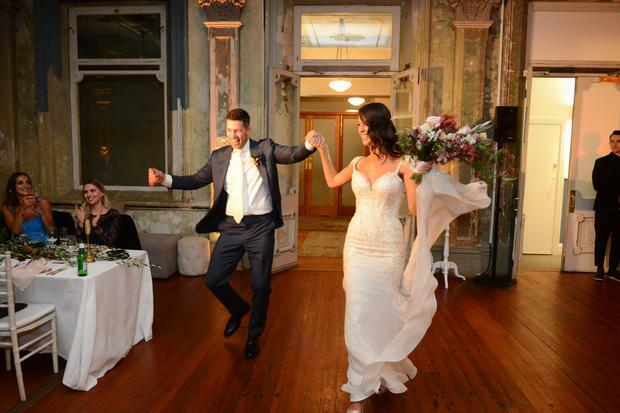 The couple held their reception in the The George Ballroom in St Kilda, a beautiful Victorian era ballroom situated in the historical George Hotel in Melbourne. The space closed for nine years for an extensive restoration which saw its stained glass windows, hand-painted ceilings and brass and etched glass gasoliers meticulously renovated and returned to their original splendour. It reopened in 2015. Emily wanted a glamorous, old world theme for the day, and was 'adamant' about there being no black. "There wasn’t any at all!" she says, "everything was white, cream, soft pinks and rich, deep pinks. The florist really outdid herself! The cutlery, the napkins, everything just worked exactly the way I had hoped it would." The bride told her florist, Nat from Foxy Evergreen, that she didn’t want 'standard flowers' - and was 'quite specific about it'! She loved the cascading look, and wanted to avoid including any blooms native to Australia. They opted for whites, softs pinks, magenta and greenery. The couple opted for live acoustic music for their ceremony and for parts of their reception. Their performer, Isaac from Main Entertainment, transformed into a DJ later in the night. Emily and Pierre's impressive wedding cake was comprised of two different layers; one vanilla citrus and one vanilla berry. They opted against chocolate cakes, as they had chocolate and coffee dessert canapés for their guests. They went with a three-tier cake on the advice of their cake supplier, Niko's Cakes, whom the bride explains suggested a three-tied as both herself and Pierre are tall. "I wasn’t sure what difference it made," she says, "but it did look great!" The couple minimooned in LA, New York and Toronto straight after the wedding. For their honeymoon they spent ten days honeymooning in Bali: four nights in Ubud, and the remainder in Seminyak. 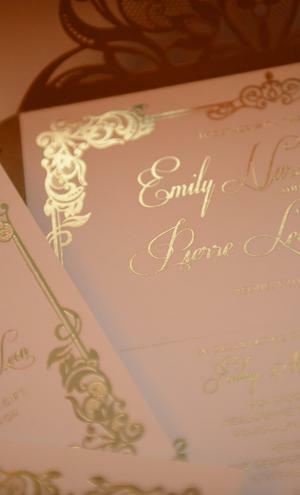 The highlight of the day for both Emily and Pierre was they first saw each other on the aisle. 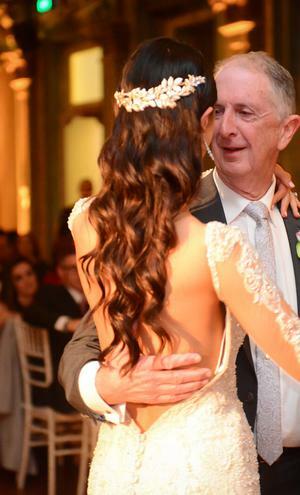 For Emily, walking down the aisle with her father was also a big highlight, and a moment she says she will never forget. Emily's advice to other couples planning their big day is to make sure you know what you want before you go talking to suppliers. "Scour the net and Pinterest for inspiration," she adds, "if you don’t know exactly what you are after, this is where confusion can start to creep in, and you become unsure if you’ve chosen the right thing or not. 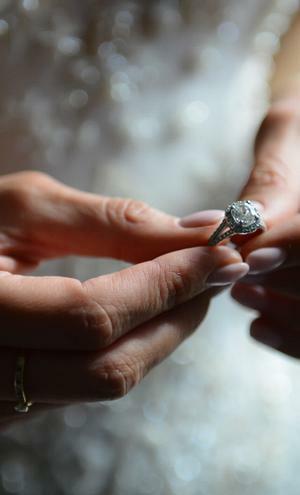 You need to be clear and concise, so that you don’t feel disappointed on your big day. Think about yours and your partner’s taste, and try your best to emulate that on your wedding day."